With these words, Secretary-General Stephen Strople brought the first McGill spring Convocation ceremony of 2010 to a close last Friday, May 28, and sent approximately 350 new graduates from the Faculty of Agricultural and Environmental Sciences off to face the future. 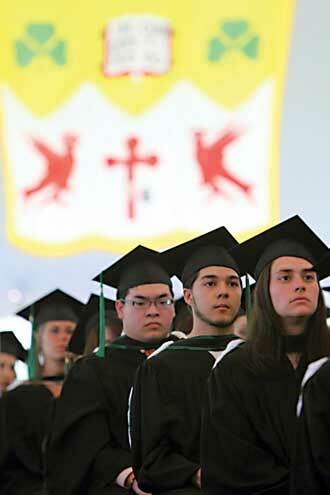 For the first time in a number of years, the Convocation ceremony on the Macdonald Campus was held in a vast tent. The covering provided welcome shade for the hundreds of friends and family of the new graduates on what was a warm, sunny afternoon. In her address, Principal and Vice-Chancellor Heather Munroe-Blum paid tribute to those friends and family members who have supported the graduating class of 2010, then urged the graduates themselves to become leaders in an increasingly global and complex world. Honorary Doctorate recipient (Doctor of Laws, honoris causa) Jacques Bougie, a former CEO of Alcan Aluminium and successful business leader and philanthropist, delivered the Convocation Address, sharing some career tips and advice with his fellow graduates. Skyler Veazey (BSc in Food Science) delivered the Valedictory Address. Read her Point of View article on graduation in the next issue of the McGill Reporter.